Early this week, the San Francisco Chronicle ran an opinion piece by Trump ally and Hoover Institution research fellow Bill Evers. The goal of the piece was to influence voters in the upcoming election for the State Superintendent of Public Instruction, but its focus was quite strange to me, for reasons I detailed in a letter to the editors My letter hasn’t been printed and presumably won’t be at this point, so I offer it here instead. What a curious hit piece by Bill Evers (“Tony Thurmond, California schools chief candidate, has poor record as trustee,” Sept. 17). Let’s start with what Evers chooses not do. There’s no criticism of any of Thurmond’s votes, or bills, or policy positions, and no mention of Thurmond’s opponent. Instead, Evers tries cast doubt on Thurmond because, as one of five trustees, for four years ending in 2012, Thurmond didn’t personally solve the problems that plague virtually every impoverished school district in America. Are we to infer that Thurmond should have individually raised millions of dollars, refurbished schools, taught students, and prevented crime? Of course, Evers doesn’t mention that in six years since being a trustee, Thurmond has a distinguished record of advocacy and legislative leadership that helped California’s students and schools. Why doesn’t Evers mention Thurmond’s opponent, Marshall Tuck? Likely because Tuck’s brief, mixed record in school leadership ends in 2013. He’s done nothing noteworthy since then, except lose an election for this office four years ago and cozy up to right-wing billionaires spending heavily on his repeat candidacy. 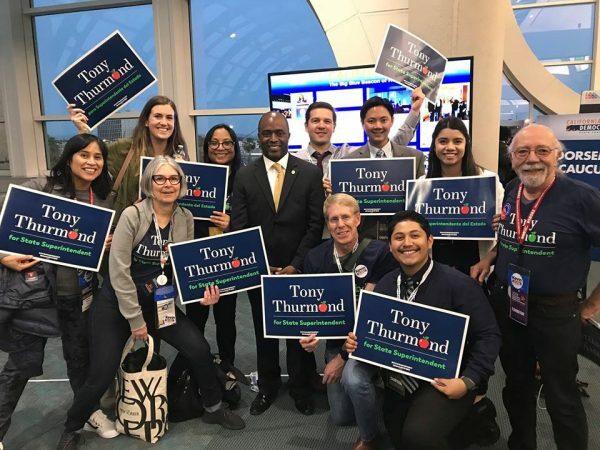 Tony Thurmond is undoubtedly the superior candidate for Superintendent of Public Instruction.